You have no idea how pleased I am to see you. A hazy metaphorical grey fog hung over my head for the last two weeks of February refusing to budge and honestly, sometimes it was difficult to summon the desire to simply get out of bed in the morning. It has been many years since I felt that way, but the mist is beginning to lift and I think the promise of spring has a lot to do with that. When asked what my favourite season is I immediately say winter because wrapping up in layers of knitted jumpers and scarves is my favourite, but really I think it's spring. What could be better than watching life awake from its slumber? It carries its own special kind of magic. It's been a while since I sat down to write, but this feels nice. I've missed this. I've missed you. Apart from watching a few YouTube videos here & there I've had some time away from the internet and social media and it's incredible how refreshing it has been. I was asked once whether because I'm an introvert and need time to recharge after being with others, if I also needed time away from social media. I said no, but now I'm wondering if the answer is really yes. There's a really great Ted Talk by Lemn Sissay, a wonderful poet, where he talks about how much he believes that each one of us is a time machine; we take everywhere we have ever been with us and we're in constant states of migration. I feel like I'm on the cusp of a big life shift and I think perhaps March is going to be the beginning of that change. I've started to paint and photograph again. I've been practicing knitting even though I'm really not very good, and I'd like to get a loom to try and make one of those incredible looking woven wall hangings. It's been a long winter and now it's time to write, to create, to believe, to imagine, to try, to flourish, to fly. May march bring you so much happiness. I spent a week at the beach with my friends and while I had my phone with me, I found myself leaving it in my room and just completely forgetting about it during the day. Everyone I would want to contact was there, and everything else didn't really seem to matter. It was definitely a refreshing experience and something I want to do more often. I've also seen the Ted Talk by Sissay and I was really surprised by it. I didn't know him before, but I really liked his talk and his way of describing these states of migration! I'm not an introvert, but I also need some "off-line" and "me-time", otherwise everything just turns into a big puddle of mush and my brain goes on strike ;) I am really looking forward to your creative projects, I hope you will share them with us! Good to see you back, and here's to March! Loved reading this post - my January felt like how you've described your last couple of weeks in February but it really is lovely seeing the mornings and evenings get lighter and the world get greener. That's an amazing post, full of joy and good feelings. Spring is a great season... and I think it's the time of the year when we also wake up in a spiritual and sentimental way. We regain energies... to start over. Have a great month! Such a lovely post. It is so nice to take a step back from the internet sometimes, I find it can be very overwhelming and it does take over my life a little too much. 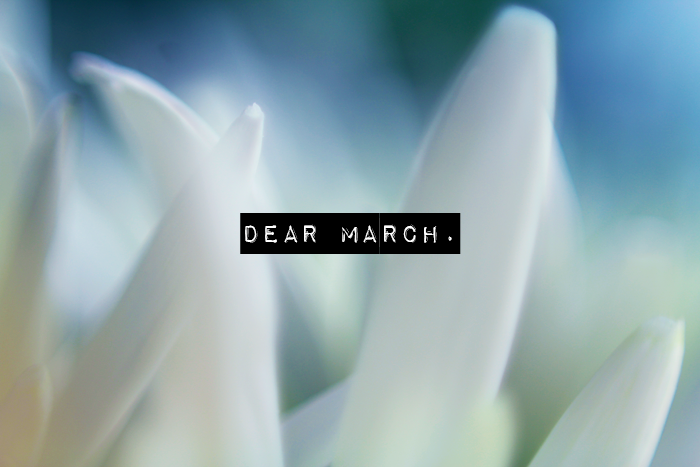 I hope March is good to you Jennie. I can relate to the grey fog over your head for the past few weeks. I've felt the exact same way - like I've been living life on auto-pilot without any passion in anything that I'm doing. I'm finally starting to see the bluer sky. Hopefully March will be good us both. I love spring for the same reason - plus it's so nice to have the warm weather. I was wondering where you were, it's unusual for you to be gone from blogging for half a month. I'm happy you're back!